Razor’s Edge $500.00 Scholarship – donated by Ryan Ray. This Scholarship is presented to a WTS athlete who is 14 years of age, and younger. This athlete has demonstrated a strong work ethic and dedication to the 222’s Fastpitch WTS program. This athlete has shown continued improvement throughout the winter in her softball skill set and leadership qualities. 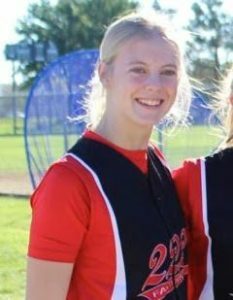 Shaye Amundson Memorial $500.00 Scholarship – donated by 222’s Fastpitch. Before we get into the scholarship criteria, we want to share a little about the person who we are remembering with this award. Shaye was a former 222’s Fastpitch Athlete, who played on our 2015-2016 18U Team. In the summer of 2016, we all lost Shaye in a tragic car accident. Shaye’s passing touched so many people in and outside her community of Debden, SK. To say Shaye was a spark plug on our 222’s Fastpitch Team is definitely an understatement. Not only was Shaye a very talented softball player, but what made Shaye something special on our ball club was her passion and heart that she exhibited every time she stepped on the field. Thank-you Shaye for making everyone around you a better athlete and a better person! This Scholarship is presented to a WTS athelete who is 15 years of age and older.